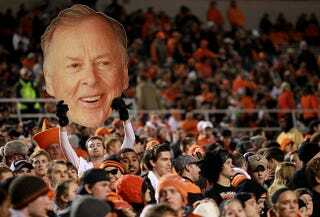 For billionaire businessman and Oklahoma State sugar daddy T. Boone Pickens, only two things are certain: wind and death. Well, the wind farm didn't work, and neither did Pickens's genius fundraiser idea to take out life insurance policies on some of OSU's richest and most elderly donors. Back in 2007, on the advice of Pickens, the Cowboys athletic department purchased policies for 27 of their very biggest fans. Most were donors and season ticket holders, and all were over the age of 65. Upon an insured donor's death, Lincoln Financial would pay out $10 million to the sole beneficiary, the OSU athletic department. It was called the "Gift of a Lifetime" program, and it was a wager, like all life insurance, but presumably the actuarial tables were in the university's favor. For two years, no one died, and OSU was on the hook for the annual premiums, to the tune of $33 million. So in 2009 the school canceled the program, accepting that betting on and hoping for the deaths of its donors was "morally bankrupt" and a financial failure. So OSU sued Lincoln Financial, trying to recover their premiums. They claimed that Lincoln misrepresented the costs of the plan, and were negligent in delivering the physical policy contract. Lincoln countersued for breach of contract. Last week, a federal judge in Dallas dismissed both suits, leaving Oklahoma State on the hook for that $33 mil, and forcing them to pay court costs. Death waits for no fan.